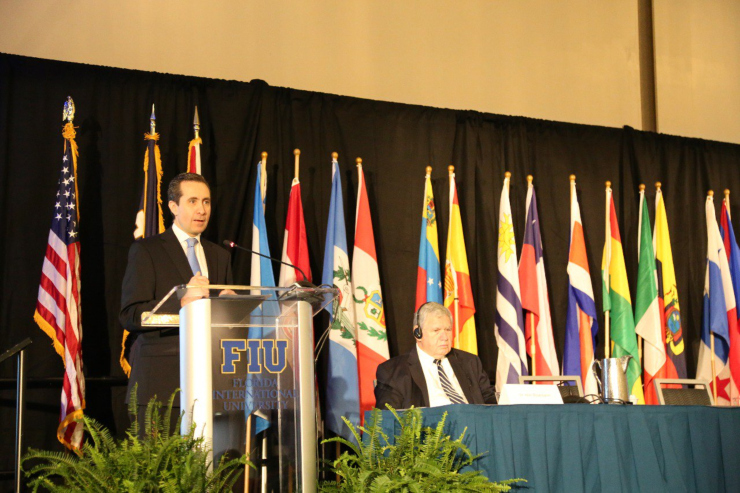 Jorge Familiar Calderon, the World Bank’s regional vice president for Latin America and the Caribbean, speaks at the 24th Inter-American Conference of Mayors and Local Authorities hosted by FIU. With a worldwide audience in the tens of thousands, the World Bank unveiled a pivotal report on the future of urban economies in Latin America and the Caribbean during a conference of mayors that FIU has hosted for more than two decades. Streamed live on Facebook for the first time, opening day of the 24th Inter-American Conference of Mayors and Local Authorities drew an online audience of more than 140,000 people – many of them local government and non-profit officials from around Latin America – to hear the latest research on how to build better, more resilient cities in the region. World Bank officials said the decision to announce the report in collaboration with FIU was no accident. Hosted by FIU’s Institute for Public Management and Community Service – part of the Steven J. Green School of International and Public Affairs – the conference drew nearly 500 people from 21 countries to the Hilton in downtown Miami. A panel that included Miami Mayor Francis Suarez and FIU public administration professor Allan Rosenbaum, director of IPMCS, focused on possible solutions for the region’s cities. Rosenbaum, who has been part of the conference since the beginning, said it was no surprise to him that the World Bank chose the Miami event for its announcement. “Over the course of the past 24 years, this conference, which was established by FIU and Miami-Dade County, has come to be recognized as the single most important non-political activity bringing together municipal officials from throughout the hemisphere,” he said. Among other things, the report found that while productivity in Latin American and Caribbean cities is on par with much of the rest of the world, it lags far behind that of major cities in North America and Western Europe. Greater investment in infrastructure, public services and education could go a long way toward boosting productivity and reviving economic growth, the study found. While it got the most headlines, the World Bank report was just one highlight of the three-day conference, which has become the largest annual gathering of local leaders from throughout the hemisphere. Co-sponsored by the World Bank and Miami-Dade County, the event included discussions on climate change, water security, citizen engagement, the use of social media in public safety and emergency management, transportation and smart cities. Miami-Dade County Mayor Carlos Gimenez, Miami-Dade Commissioner Javier D. Souto and Meredith Newman, FIU’s vice provost for faculty and global affairs, each gave opening remarks. The World Bank study, “Raising the Bar for Productive Cities in Latin America and the Caribbean,” is available online in English and Spanish. Video of the presentation on the report can be viewed here.